TIP: I only make cheese and tomato on toast as the level up percentage increases the same for all dishes so its more beneficial to make the cheese on toast as it only takes 1 minute! After the time has passed come back and click the food plate bubble above your sims head, they will put the plate down and you will find one of the cooking utensil collectibles. Every time your sims cook their cooking hobby skill level up percentage will increase, once you reach 100% you will level up, there are 6 levels. You need to reach level 6 to be able to unlock all of the cooking utensil collectibles, once unlocked you will be able to find them. Bronzed Measuring Spoons, Silver Measuring Spoons and Gold Measuring Spoons are now unlocked in the hobby collection. This is my favourite hobby as its really quick to get LPs and money by doing it, you just need several sims in a room with a stove and toaster for each person and then do the 1 minute option over and over and within about an hour or so (depending on how many sims you have) you should be able to find all the utensils as long as you have unlocked all 6 levels! But there will be so many dishes laying around you should have a few sims there to clean them up. How Do I Have So Many LPs explains this in more detail. Hi. I have followed your advice re using the cooking hobby to earn LP’s and it is great. I have noticed that since the last update (camping grounds) that you now earn 7 XP’s for cleaning the plates. I now have a few sinks in use to add a few more XP’s to my game. Great blog really helpful. Thanks! Please help me! What level do I start the cooking hobby I’m on level 15 and I still don’t have the cooking hobby! you have to complete the bread winner quest to complete the cooking hobby, that quest will probably be in your quest queue if you haven’t done it yet. In the latest update, you have to wait slightly longer to cancel cleaning up the dishes. If you cancel before the dishes disappear, they will stay on the ground/table. If you have more than one Sim pick the dishes up around the same time, some of the Sims will still get the footprints above their heads and cancel the action after they pick them up. That’s still the same as in the previous update. I know, its very annoying! Firstly, thank you for this guide it helped me a lot 💖 but when I leveled up my Sim to level 6 in the cooking skill and it said I got the 1lp reward, I didn’t get it at all, it happened twice so I didn’t get the 2 LP from leveling up the 2 sims , do you have any idea why? I LOVE your blog!! Just wanted to comment that I get at least 7 XP for cleaning up the dishes and sometimes bonus XP and stuff to build the monuments!! So it’s kind of worth the 3 seconds! Just a thought 🙂 If I hadn’t found this post about the cooking hobby I would never be done it!! Thank you so much and please please keep blogging!! you need to complete the bread winner quest then cook cheese on toast until you get to level 4 to unlock quiche. This is so helpful. A quick question though. Is it not possible for a sim to have more than one hobby? I tried having my level 6 cooking sim do the salsa hobby but it says the sim will forget the cooking lessons. How do I go about this? Help! Every time I go to cook something my game freezes and shuts me out. Because of this I can’t complete my quests and advance in the game. Contacted EA a while and a half ago and still haven’t gotten a response back. If I a use a three star stove, does it help in some way in completing the hobby faster? you need to wait until you get the quest before you can start this, look in your quest queue, it should start automatically once a previous quest has been complete. What if u dont pickup your plates at all? Then there will be piles of plates with black rings around them which you will have to clean up over and over again before you will get rid of that pile. Hi, I was trying to finish up my bread winner quest and I accidently cleaned up the plates before my sims got to eat them, now I can’t call them to the meal of the burgers because I can no longer make it. What do I do? You can cook something else, that will give you more plates but if you use the same sim you will still be able to make burgers. Thanks x 1,007,532,577 for blogging about Freeplay! 1) the DISHES!!!! I’ve been trying to rush and complete fruit collecting to get the bungalow with 15 hours left, so cooking for SP is helping, but it takes 15 minutes to finish a collection & 1 hour to clean the dishes. I have a room with 10 stoves, 1 toaster in the corner so that I only need one, and 10 sinks. Even though there’s a lot of sinks, the footprints always come up, because they all want to use the same sink. Is there a work around? 2. 10 of my Sims are level 6 chefs. Would switching hobbies and switching back to cooking help at all? For some reason which is very annoying the sims all want to use the same sink, there isn’t really much you can do, maybe just have one sim clean up and the rest of them still cooking? I received the bronzed amd gold spatula and the bronzed and gold cheese grater…. will I earn the silver spatula and silver grater later or did I miss them somehow?? You will earn them later, you don’t get them in order, you get them randomly. complete the hobby until you win it, you don’t find them afterwards they are just collectibles, find them all and win the prize. Can dishes that require one star appliances be cooked in a house that only has the higher star equivalents? Hi there 🙂 your blog is useful and i always view your blog before i begin a new quest!! You need to place them on a counter top or table, you cannot put them on the floor. I went ahead and kept track just to see, and (not accounting for the initial costs of cooking) it adds up to 4,790 simoleans. It seems like it might be the fastest way to make money, depending on how many tries it takes to get all the utensils. Hey guys I was reading through about the plates!! CLEAN THEM! I had so much plate “data” in my cooking house (and the mountain of plates was way to high to clean that at first my cooking became suuuuuuuper slow (I thought it was because I was using an old iPad) then it started to crash and rob me of LPs! I went to a new lot and built a new house and it’s as good as new! Oh and thanks for this blog! I LOVE IT! In doing the cooking hobby my sims level up to the point where it says 10000 now available. Next 1LP. But then when I look at my money it hasn’t gone up by 10000!!!! When they level up and it says 750 jow available it increases my simcash by 750. But not for the 10000. Whyyyyyyyyyyy? I’m so frustrated by this. It happens over and over. Hi the girl who games! I find your blog very helpful and use it a lot! I have used your cooking hobby strategy to get lps, and it is very effective. However, I am having trouble finding ways to spend these lps 😅 any recommendations on what to buy with them? Thanks! I’m glad it helps! I mostly just used them to speed up quests and hobby events but there are a few nice LP houses! I’ve been working so hard to get the bronze spoons in the last level of the cooking hobby. But I can’t seem to get them. Do you have any suggestions? You will just have to keep going, you will get them eventually. If i cook in a neighbors town and dont clean up the dishes, will they still be there when i leave and re enter their town? Which book case do I get when I am looking for grandmas recipes? Thanks so much for the tip! I have a lot in my town with 10 garden plots, 10 showers, 10 toilets, and 10 coffee makers… now 10 stoves (a toaster, and a fridge)… I call it my slave farm because ten sims are there from the time they come from work to the time they go back in! 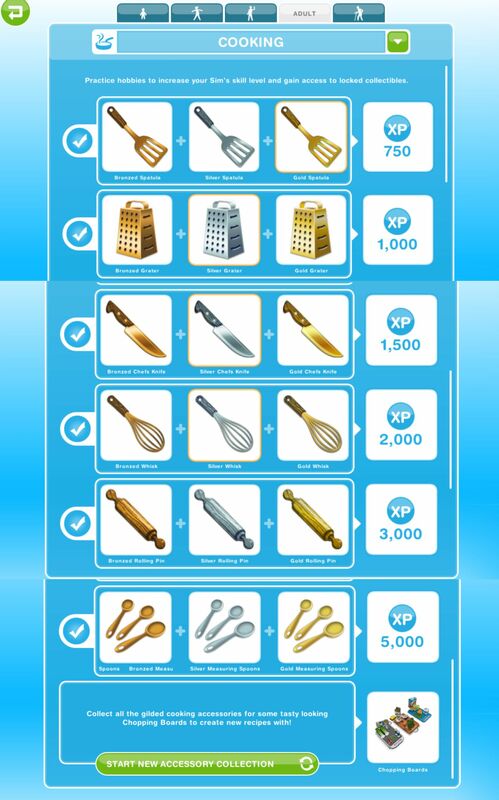 To get spoons you need a sim to be at level 6, keep cooking cheese on toast until a sim reaches level 6 then they will start finding the spoons, you will also be able to unlock the chopping boards once you complete the hobby for the first time. After that you can start earning LPs! I am not able to buy a one star toaster, what’s the reason? Have you completed the bread winner quest yet? Why must I clean up plates? Can’t I just have all my sims eat them periodically? They can eat it but there will be an empty plate left which you have to clean up afterwards anyway, its up to you, its just quicker when completing this hobby to clean up the plates instead. Hello, I noticed that the first time you find a utensil you get a reward of simoleons. do you have a chart somewhere of those values? I noticed some were worth 50 where others were worth 500. Oh my goodness, thanks thanks a bunch! This is a very helpful website, i just started playing freeplay recently and getting hooked but frustrated in the same time of how slowly things seems to work! I have a question regarding this hobby, i need a 2 star microwave to cook spaghetti (I’m in level 3) but I couldn’t find it in the kitchen section of the home store! Is there anything i should do to get the microwave to appear or something? I have a tip. If you remove the door after all the sims are in the room, and don’t place a sink in the room, cleaning the plates takes a much quicker time. The sims will not have to find a sink and the plates will disappear without them walking anywhere. I discovered a great trick for cleaning dishes faster. Kick the garbage can and turn the sinks toward the wall (or otherwise make them unaccessible) and the cleaning time is just as long as it takes the sims to get to the dish. I only have 4 sinks (facing the wall of course) in my 10 stove house and it works great! My house is now filled with uneaten dishes is there a way to get rid of all of them at once? Unfortunately no, you will have to clean them up one at a time.